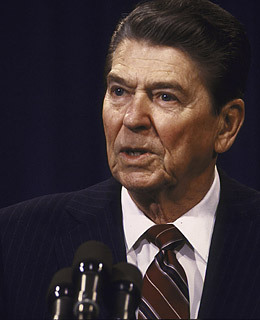 He may be the patron saint of limited government, but Ronald Reagan started out as a registered Democrat and New Deal supporter. An F.D.R. fan, the Gipper campaigned for Helen Gahagan Douglas in her fruitless 1950 Senate race against Richard Nixon and encouraged Dwight D. Eisenhower to run for President as a Democrat in 1952. While he was working as a spokesman for General Electric, however, his views shifted right. "Under the tousled boyish haircut," he wrote Vice President Nixon of John F. Kennedy in 1960, "is still old Karl Marx." By the time it actually happened in 1962, Reagan's decision to cross over to the GOP didn't come as much of a surprise. "I didn't leave the Democratic Party," he famously said. "The party left me."